Centro Comercial Príncipe Pío, A Spectacular Shopping Mall In Madrid. Centro Comercial Príncipe Pío is a shopping mall in the western part of the city of Madrid. The building that houses the spectacular shopping extravaganza started life as a railway station. It still performs that duty, though to a much lesser extent today than it once did. It also has some bus lines, as well as a Metro station, all of which means that access to and from Centro Comercial Príncipe Pío is about as good as it gets in Madrid. The shopping center has three floors where you will find shops with names like, Stradivarius, H & M, Eurekakids, Mango, Tapioca, Zara, Tintoretto, Bottega Verde, Natura, Parfois, Pull & Bear, and Colonel Oisho. You will also find shops specializing in gifts, sports, cosmetics, and much, much more. There are restaurants, cafés, a McDonalds, a cinema complex with some eight theaters, nightclubs and more. The original building that is Centro Comercial Príncipe Pío was built at the foot of la montaña del Príncipe Pío, a hill named after Prince Pius of Savoy. Centro Comercial Príncipe Pío was first called Estación del Norte and is still sometimes known as that today. It lies just off the Paseo de la Florida and has its own Metro, Príncipe Pío. The buses 25, 33, 39, 41, 46, 75, and 138 all serve the shopping mall. The mall has eight store selling fashion good and accessories, jewellery and watches, perfumes, photographic equipment, and telephony equipment. It has services such as banks and opticians, furniture stores and sports stores. Centro Comercial Príncipe Pío is a beautiful, airy, wide and spacious place with a modern feel that belies the building's long serving history. This is a place for everyone from the very young to the older, young at heart. 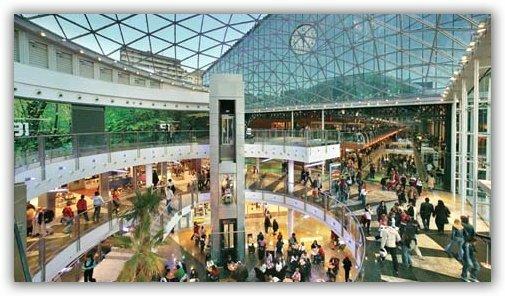 The shopping experience at Centro Comercial Príncipe Pío was started in January 2005 with a budget of 3.39 million euros. The refurbished building stands in an area that has several interesting attractions nearby. To the immediate north of Centro Comercial Príncipe Pío is the Templo de Debod dating back over 2,000 years, the Teatro Real, an excellent opera house dating from 1850 is one of the finest opera houses in the world, and it lies to the southeast, and not much further south is the Cathedral of Santa María la Real de La Almudena, built in a Gothic revival style. Centro Comercial Príncipe Pío is not too big and impersonal. However, it's not too small either. It is a complex that is just about the right size for anyone to enjoy. The restaurants and other leisure establishments, tend to stay open later, until 1am during the week and until 2am at weekends.